Buying a home is an exciting venture, but it’s also one of the largest purchases many make in their lifetime. While many first time and seasoned home buyers know to crunch the numbers, the one number that can sometimes stand out is the Land Transfer Tax. It’s important to understand this number so that you can budget for it, and avoid any possible sticker shock. The Ontario Land Transfer Tax is a tax which buyers of houses and condos in Ontario pay when they purchase a property. The seller does not pay this tax, and all buyers are responsible for paying this tax when they take possession of a property. This number varies depending on the property, but your realtor and real estate lawyer can help you with what to expect before you put an offer in on the home so you can budget accordingly. It’s important to note that the amount is due on closing. 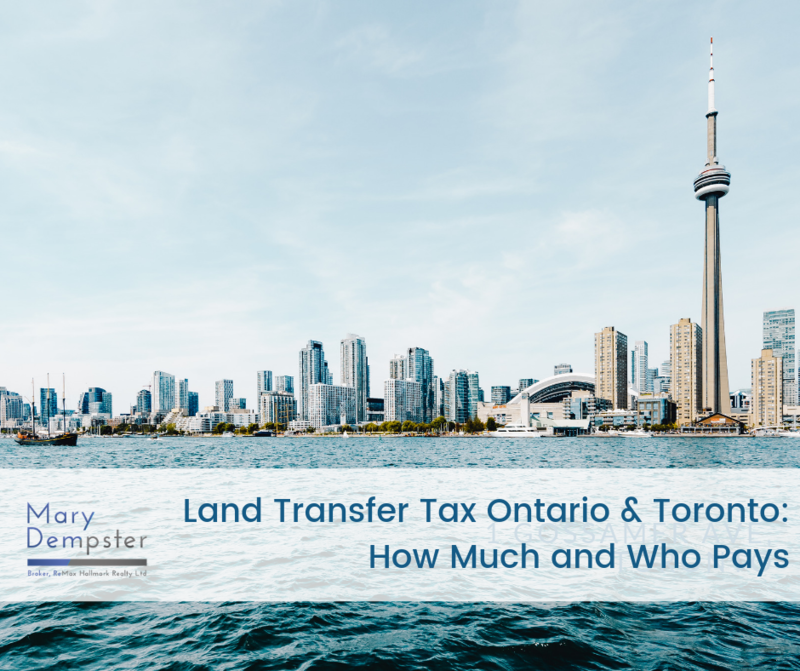 In addition to Ontario Land Transfer Tax, buyers purchasing a home in Toronto must also pay the Toronto Land Transfer Tax, also called the Municipal Land Transfer Tax (MLTT), on top of the Ontario Land Transfer Tax. This tax is applicable to homes east of Highway 427, south of Steeles Ave, west of Scarborough Pickering town line, and north of the lake. In order to get an estimate on the cost of your land transfer tax, take the total amount of the home value using the property’s purchase and calculate the tax amount based on a percentage. First time home buyers do need to pay land transfer tax in Ontario and Toronto, but are eligible for a rebate. Luckily, first time home buyers are eligible for a tax refund of the Ontario land transfer tax, up to a maximum of $4,000. This will cover full tax for any homes purchased up to $368,333 and if your home purchase price is above that, you will still get the $4,000 rebate but will cover the rest of the land transfer amount. There are some stipulations, but many first time buyers do qualify for this rebate. Talk to your realtor if you’re not sure. You may also be exempt from paying land transfer tax on certain transfers of land, such as transfer between spouses, transfers of farmed land between family members, transfers from an individual to a family business corporation, or transfer of a life lease in a non-profit organization situation. Your realtor and your real estate lawyer can help you navigate these instances. If you have any questions about your land transfer tax on a potential new home, talk to your realtor today. We are here to help guide you through the entire process, and help you understand everything that goes into buying your new home. We are so lucky to live in the Greater Toronto Area, surrounded by amazing architecture and cool sights. There is a lot of history in a city like Toronto, and many enjoy walking the streets and taking in the beauty of the buildings and all the city has to offer. Here are a few of my favorite pieces of architecture to take in when I’m wandering the city. Spring is (almost) in the air and many home owners are getting ready to freshen up their home, either to sell or to increase their home value for when they do choose to sell in a few years. So, what are the top home trends for 2019? From colour palettes to new technology, there are a lot of fun things in store. Here are the top five trends I’ve been noticing in the Toronto market. Buying a home in Canada is a great investment. The economy is booming and the real estate market is going strong as the city and suburbs continue to grow. While buying a home as a foreign investor is an exciting venture, it does require some research and understanding of what buying property in Canada entails. Here are a few things you need to know if you are looking to buying property in Canada as a non-resident. Winter is upon us, and soon will be the minus zero temperatures and few feet of snow and ice us Canadians have grown accustomed to. We never know just what winter has in store for us here in Toronto, but we do know that preparing our home for the cold, wet, and ice is the best way to make sure we have a stress-free winter season! There comes a time when adults 50 plus decide that it might be time to move. Whether it’s due to downsizing and needing a more functional home, or to move closer to family, often seniors decide that selling their home is the right choice. How do you choose the right Seniors real estate agent in Toronto? Here are a few tips! Selling a home in Toronto with a realtor is an exciting venture. The city’s real estate market is still very hot, and buyers are busy looking to buy the perfect home or investment property. Working with a real estate agent to sell your Toronto home is a smart idea – realtors understand the process, know the market, and can ensure that everything is done professionally and legally. Here's the Best Tips & Advice on Selling a Home in Toronto, Ontario! Downsizing is a step many Seniors take as their lifestyle changes. Whether it is to move closer to family, generate rental income in order to travel, or simply because a larger home is no longer necessary, downsizing is a decision that can be of great benefit to you. Here is my guide to Downsizing for Seniors. Every spring and summer, homeowners begin the quest for the perfect, lush green lawn and beautiful yard. While for some, it may seem like a daydream, for others achieving the best yard is a breeze. What’s the secret? A bit of TLC and attentiveness, and your yard should thrive this summer. It doesn’t have to be a ton of work – but a few tweaks should get your grass growing green and flowers blooming in no time. Babyproofing is an exercise many families go through – whether they’re expecting their own child or someone in the family is about to have a new baby that will be coming around. In a world full of distractions and safety hazards, it’s natural to want to make sure your home is a safe haven for a new baby or toddler. Luckily, the process can be stress-free and easy with a few easy tweaks. A simple refresh of your bathroom can make a world of difference, and remember that everything you put into your bathroom renovation will have an impact on your home value. Whether you’re thinking about doing your master bathroom, ensuite, or the little guest bathroom on the main floor, you’ll be thankful you did it! Potential homebuyers love walking into a beautiful kitchen, and it’s no wonder that the kitchen can often be a make or break for getting the most value for your home. From DIY projects to hiring a contractor, here are the basics when it comes to renovating your kitchen. If you’re considering buying a home in the city, chances are you’re thinking about condo or townhouse living. As the GTA continues to grow, more and more condos and townhouse developments are popping around our vibrant and continually expanding city. Here is what you need to know about buying a unit in a pre-construction building. As we roll into the new year, it’s time to add some smart home technology that will make your life easier at every turn. The trends this year are home security, touchless, wireless, and apps. Here are my top picks. The new OSFI 'stress test' mortgage guidelines will apply to both new home buyers and current homeowners as of January 1, 2018. Find out how the new rules may affect you and your mortgage. With a little handy work, a few garbage bags, some gloves, and a rake, your home will be ready for winter in no time with these 10 fall home maintenance tips. Nothing says “wow” like a well-maintained outdoor property. Quality outdoor living space is very important to potential home buyers. From simple DIY projects to hiring a professional, a few upgrades to your outdoor space can help increase your home's value when it comes time to sell.